Developer GURNER has acquired its third and fourth Brisbane sites in as many months, snapping up two adjacent sites on the riverfront at Hamilton. The first site, located at 92 Kingsford Smith Drive, is 1792 sqm and had sat vacant for a number of years. It was sold via an expression of interest campaign led by CBRE Director of Metropolitan Investments, Mike Walsh and CBRE Senior Manager, Michael Platsis. The second site, at 80 Kingsford Smith Drive, is a 1493 sqm site and was acquired off-market from a different vendor, giving GURNER a combined 3300 sqm site with uninterrupted views over the river to the CBD skyline. The acquisitions follow GURNER's recent purchase of two prime development sites in Fortitude Valley totaling $290m in project value. GURNER purchased the latest sites in September and October with plans to transform them into a luxury apartment precinct with about 280 apartments worth more than $170 million. GURNER founder and developer Tim Gurner said the project, which is located in one of Brisbane’s most affluent areas where apartment stock is limited and the median house price currently sits at $1.175m, would deliver a luxury two-bedroom, two-bathroom offering for roughly 40 percent less than the suburb’s median value. “These sites present an incredible opportunity due to their incredible and never-to-be-built-out views over the Brisbane River and CBD, coupled with the sites’ ideal position just three kilometres from the city centre," Mr Gurner said. “The sites fall into our development model which identifies prime sites within a 1 to 3 kilometre radius of the CBD with great amenity and of an iconic nature, so for us there was no question of ‘if’ – we knew it was the perfect opportunity for us to build on the luxury offering we have already delivered at FV and create something truly iconic on the river. “This project will be viewed by almost everyone who visits Brisbane’s CBD from the airport so we have employed Elenberg Fraser again to create something truly iconic that Brisbane residents can be really proud of. "CBRE’s Director of Metropolitan Investments, Mike Walsh said the sites offered a unique opportunity to deliver a luxury apartment project in an area of Brisbane where competitor stock is limited. 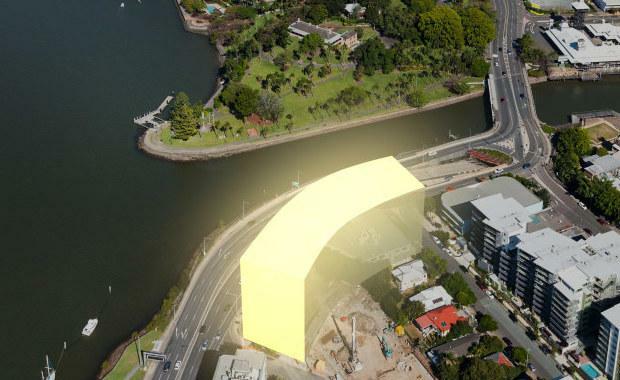 “Both 80 and 92 Kingsford Smith Drive warrant an iconic development given the high exposure position and view corridors. “We are pleased to have negotiated terms with Tim as I have no doubt GURNER will deliver another statement project underpinned by high quality design and luxury finishes. "GURNER will now embark on a pre-planning and design process with the project slated to launch to market in early 2016.